Have you ever really noticed all the art around Lake Anne plaza? Join us for a walking tour and learn more about these wonderful pieces that you see around the area. This tour will be led by art historian Phoebe Avery for the 55+ members of our community. We will begin in front of the Lake Anne Coffee House. Presented in collaboration with Reston Association. 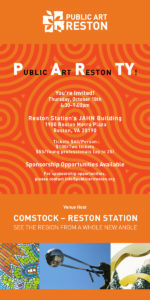 $5 for Reston Association members, $8 for non-members Register through RA's WebTrak. On April 1, Public Art Reston will be participating in ArtTable's Career Roundtable, an event where students, recent grads, interns, and young professionals who are interested in visual arts administration can network with professionals in the field. The event will take place from 6pm - 9pm and is free, though registration is required through Eventbrite. As part of 2019 Founder's Day, Public Art Reston will be hosting a guided walking tour of public art around Lake Anne. The walk will last approximately 1 hour and will begin by the Pyramid! Free and open to all. Founder’s Day is presented by the Reston Historic Trust & Museum with support from Reston Community Center and co-sponsored by Reston Association & Public Art Reston. Hosted by Lake Anne Plaza.